Beautiful villa for sale in a peaceful residential area with stunning interior design and panoramic views. This stunning 6-bedroom villa is located in the Capanes del Golf residential complex in La Alqueria. 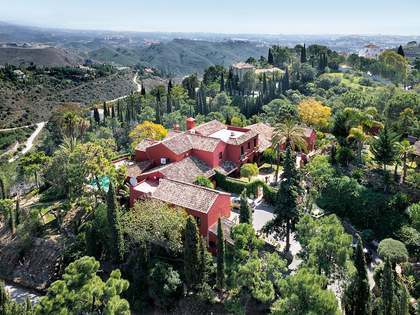 With panoramic views across the golf course and the Mediterranean, this is a very special home on the Costa del Sol. Designed by renowned architect Carlos Lamas, the villa is modern and elegant and combines natural materials such as wood and stone with the latest technology. Access to the semi-covered carport, with storage space below, is via an automatic sliding door, there is also a separate pedestrian entrance. The ground floor of the property is made up of an open-plan living-dining-kitchen area. The kitchen has attractive marble finishes and is equipped with Gaggenau appliances, there is also an island ideal for informal dining. The double-height dining area has floor-to-ceiling windows allowing abundant natural to enter. The living area has ample storage, an integrated Loewe television and a fire place. Terraces offer fabulous views of the infinity pool, gardens and Mediterranean Sea beyond. From the first floor we access the master suite and 3 further bedrooms, all with en-suite bathrooms and balconies with fabulous views. The basement, which measures 303m², has a climate controlled cellar, a laundry room and technical room. There are also 2 bedrooms on this level, one of which has a balconies overlooking the golf area and the sea. A 92m² open plan space could be converted into a gym, home cinema or extra bedrooms. A lift connects each of the floors. Further notable features include hot and cold air conditioning, underfloor heating and a Sonos audio system. There is also home automation and an alarm system. 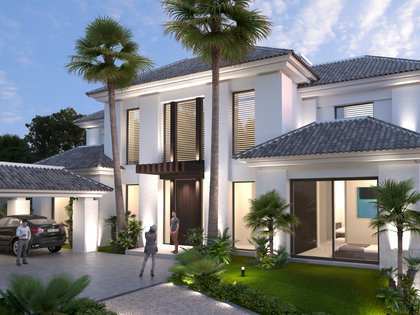 The exterior areas are equally impressive, with an infinity pool, covered and uncovered terraces and a beautiful garden. La Alqueria is a highly desirable area in Benahavís with exclusive villas and apartments. Peaceful and private with beautiful natural surroundings yet close to Marbella city centre and Puerto Banús.